Stargazing: Back to Earth (BBC2, 10pm) Continuation of the live show. 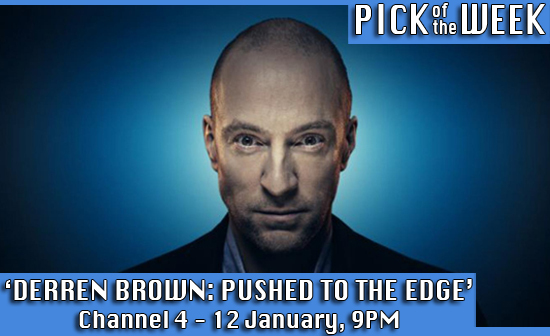 ★ Derren Brown: Pushed to the Edge (Channel 4, 9pm) Special from the illusionist, where he attempts to persuade an unwitting participant to push another person off a rooftop. Shadowhunters (Netflix) New supernatural drama about a woman who learns she's a human-angel hybrid that hunts demons, based on the Mortal Instruments book saga. Starring Katherine McNamara, Dominic Sherwood, Alberto Toubia, Matthew Daddario, Harry Schum Jr & Isaiah Mustafa. My Name is – and I'm an Alcoholic (Channel 5, 10pm) Documentary telling the stories of eight people's relationship with alcohol. Busting the Drugs Millions: Inside the National Crime Agency (Channel 4, 10pm) Documentary following the NCA as they tackle a large money laundering operation. The BRITs are Coming (ITV, 10.40pm) Announcement of the artists up for BRIT Awards this year. Hosted by Laura Whitmore. That's So... (Channel 5, 8pm) New series looking back at the events of various years, beginning with 1985. Bloody Queens: Elizabeth & Mary (BBC2, 9pm) Drama based on letters exchanged between Mary Queen of Scots and her cousin, Elizabeth I. Starring Helen Bradbury, Beth Cooke, Adam Burton, Michael Jenn & Jamie Laird. 8 Out of 10 Cats Does Countdown (Channel 4, 9pm) Series 8 of the gameshow mashup. Hosted by Jimmy Carr with team captains Sean Lock & Jon Richardson. Guests are Jason Manford & Roisin Conaty. First Dates (Channel 4, 10pm) Series 5 of the show following people on first dates. ★ Ripper Street (Amazon Prime) Series 4 of the period crime drama.